Early childhood education and school readiness is essential to preparing our children to succeed in an increasingly competitive global economy. Compared to other countries, however, the United States lags far behind on preschool, trailing a number of other countries in enrollment, investment, and quality. In February 2013, however, President Barack Obama put forth a bold plan to significantly expand access to preschool. His plan would invest $75 billion in high-quality preschool, helping our nation catch up with other countries. The numbers below show how far behind the United States is on preschool and make it evident that we need to implement the president’s plan. If the United States is to train a world-class workforce, we have to catch up to the rest of the world on pre-K. These rankings do not befit the United States. Given the importance of early childhood education to future student success, the United States must take these rankings seriously. We need to do better. The United States has a large preschool access gap. Only 69 percent of 4-year-old American children are enrolled in early childhood education. We rank 26th in access to preschool for 4-year-olds and 24th on access for 3-year-olds. Moreover, top-performing countries are outpacing the United States in preschool participation for 4-year-olds. Japan, which outperformed the United States by more than 40 points on the most recent international test of fourth-grade math, enrolls nearly all of its 4-year-olds in preschool. Our close ally the United Kingdom also enrolls at least 97 percent of its 4-year-olds in preschool. Even some countries that don’t top the global rankings on international achievement tests are outperforming the United States in preschool enrollment. Mexico, our neighbor to the south, may need to improve preschool quality, for example, but it has committed to enrolling nearly 100 percent of its 4-year-olds in preschool. What’s more, Mexico is accomplishing this despite being significantly poorer than the United States: Its per-capita gross domestic product, or GDP, is less than a third of ours. The story is similar for 3-year-olds. Seven countries including France, Norway, and Italy ensure that at least 90 percent of all 3-year-olds have access to preschool. In the United States that number is barely 50 percent. Even when children do attend preschool in the United States, they usually don’t start until age 4. Most children in OECD countries, however, begin early childhood education much earlier. Denmark typically enrolls children from age 1, and Belgium at about age 2 and a half. In fact, children in most OECD countries—including those in Estonia, Japan, and Poland—begin preschool by at least age 3. The ratio of teachers to children is a key element of preschool quality. Academic powerhouse Finland has a teacher-to-child ratio of 1 to 11 in their early education programs, besting the United States’ average of 1 to 15 and demonstrating its strong commitment to providing high-quality preschool. Sweden and Estonia both have a ratio of 1 to 6, the best among all countries. The United States underinvests in preschool compared to most countries. Public and private spending on preschool in the United States amounts to only 0.4 percent of our GDP, while Denmark, Spain, and Israel each spend at least 0.9 percent. Increasing spending on preschool to even 0.6 percent of our GDP, which would put us on par with countries such as Germany and Poland, would result in an additional $30 billion per year in early childhood education. This would be more than enough to enroll all 3- and 4-year-olds in high-quality preschool. Although Russia is not an OECD member, the United States should take notice of its preschool commitment, especially since Russia has leap-frogged the United States on fourth-grade reading over the past decade. After trailing the United States by 14 points on the 2001 Progress in International Reading Literacy Study, or PIRLS, for fourth-grade reading, Russia surpassed the United States by more than 10 points in 2011. Russia enrolls 75 percent of its 4-year-olds in preschool, spending about 0.9 percent of its GDP on early childhood education altogether. This would tie Russia for third among OECD countries if it were a member. In terms of per-student expenditures, Luxembourg leads the pack, spending more than $16,000 per child. 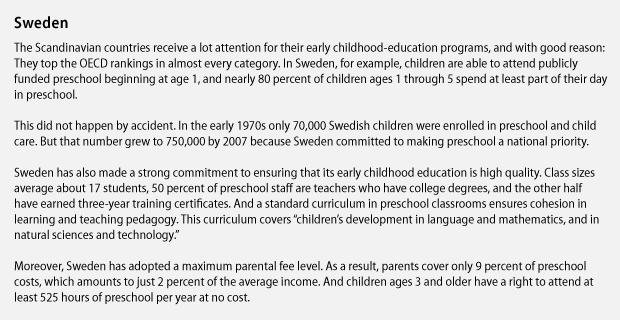 Italy and Sweden, which both have programs that are almost entirely publicly funded, spend more than $6,500 per child. According to the OECD, the average per-pupil expenditure in the United States is about $8,400; this includes, however, both privately and publicly funded programs. Expenditures for federally funded Head Start programs, which provide more than just preschool services, are approximately the same amount per pupil—$8,369 in 2009—although Head Start reaches a very small share of U.S. children. The majority of children in publicly funded programs are in state-funded preschool programs, where expenditures average only $4,143 per pupil. Studies show that high-quality early childhood education can significantly improve a child’s preliteracy, prewriting, and premath skills. Children in Tennessee’s state-funded pre-K program, for example, saw a 75 percent improvement in letter-word identification, a 152 percent improvement in oral comprehension, a 176 percent improvement in picture vocabulary, and a 63 percent improvement in quantitative concepts, compared to children not in pre-K. These vital skills have been linked to third-grade reading achievement—a predictor of high school graduation—and to success in math in secondary school and later in life. School readiness and the skills gained from high-quality early childhood education are essential to educating a strong workforce that is able to successfully compete in the global economy. And yet the United States is behind in every category of preschool. By 2020, China will increase preschool enrollment by 50 percent, providing access to 40 million children. This access will include 3 years of preschool for 70 percent of all children in China and at least two years to 80 percent of 3 and 4 year olds. By 2018, India will raise the percent of children who are ready for school from 26 to 60, for a total of about 19 million children school ready. The preschool system already reaches 38 million children under six. Commitments such as China’s and India’s are neither unrealistic nor exceptional. More than a decade ago, the British government pledged to provide universal preschool to every child between the ages of 3 and 5, and it has achieved that goal. Mexico similarly committed to expanding its early childhood-education enrollment, increasing its participation by almost 30 percent over the past eight years. The United States is in a race to educate a globally competitive workforce—one that is needed to keep our economy strong and booming. As we wrote in the aforementioned report, “intellectual and innovative superiority” will rule the day. We can continue to lead on that front by making a significant investment in education, or we can instead allow ourselves to fall further behind. 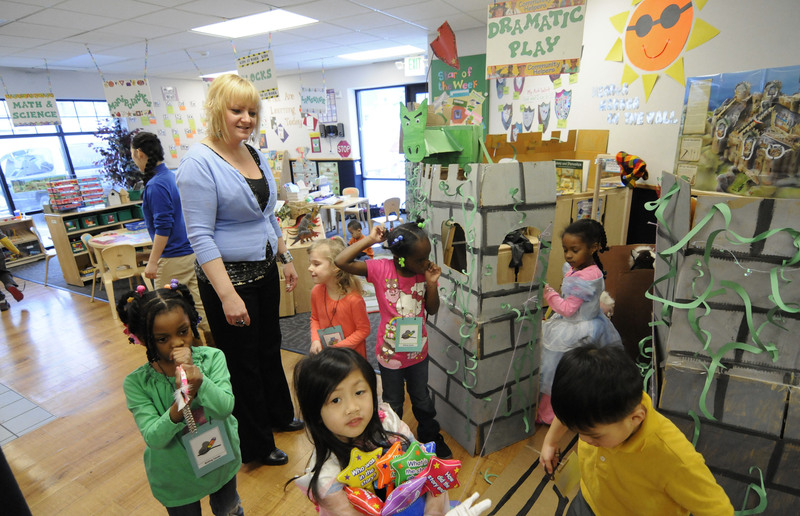 High-quality preschool is critically important for building a globally competitive workforce. Yet our numbers are not impressive. We lag behind other countries in access, quality, and investment. We are getting beat by top-performing countries whose commitment to preschool helps propel them forward, as well as by countries we usually do not expect to see ahead of us in rankings. Meanwhile, China and India are racing ahead to improve their student achievement and are making the necessary commitments to do so. The United States has a lot to do to catch up to the rest of the world on early childhood education. Increased investments in high-quality preschool education for all children, regardless of income, will put us more in line with the rest of the world, help keep us on track with China and India, and ensure school readiness for our most at-risk children. Juliana Herman is a Policy Analyst with the Education Policy team at the Center for American Progress. Sasha Post is Special Advisor to CAP President and CEO Neera Tanden. Scott O’Halloran was an intern with the Education team at the Center.